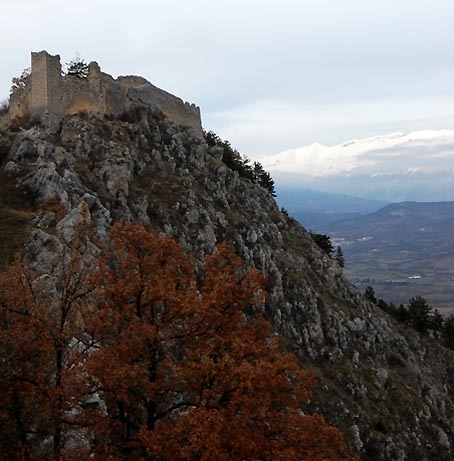 Termocrìs is Old Greek for rugged, from which the ruined Abruzzo town & Castle of Ocre derives its name. It’s a perfectly apt description of this ruined village and castle, perched 933 masl looking down into the Aterno Valley with inspiring views down into the Parco Naturale Regionale del Sirente-Velino. Although you cannot get inside the walls of the castle and visit the remains of the 7 towers (as yet unrestored), walking around its perfectly preserved limestone walled triangular perimeter (470m in total) is part of the pleasure, whilst weaving in & out of the surrounding pine woods. The castle was first mentioned by Pope Alexander III in 1178, but badly burnt in 1280. In 1424 it was rebuilt by Andrea Fortebraccio, who in the C15th came the closest to creating a state for central Italy until the time of Garibaldi. If you are a fan of legendary perspective artist Paolo Uccello you’ll be able to recognise the name of Fortebraccio as he is one of the key characters portrayed in Uccello’s “Battle of San Romano. It is a beautiful place. Even though it's all in ruins you get a feeling for what it might have been like centuries before – and if you are lucky you will feel like you've just returned to Narnia. Bring a jacked even in August because the winds can sweep by. And watch out, there are no railings on the edges of the cliff.